The client keeps chasing me, checking whether it can be done 1.5 hours earlier. Felt really stressed, as I am busy with my jobs on hand too. Told them I can't promise them, as we have agreed 5:30pm before the client confirmed her order. I don't want to give empty promise, and when they come at 4pm, it is still not done yet. Anyway, I finished it 5 minutes before the agreed collection time. 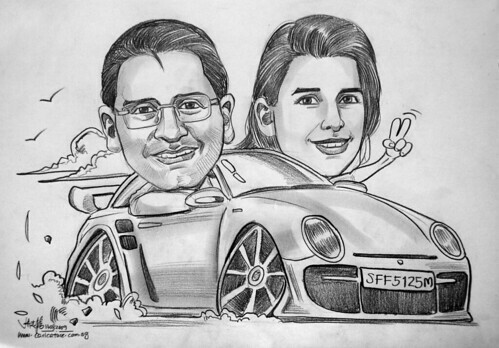 Caricature theme is their boss and bosses' wife iin a Porsche car, as a farewell gift for the boss.